In between making wedding cakes it was Tom’s birthday. He’s been away for the last few years on his birthday so I haven’t been able to make him a birthday cake. 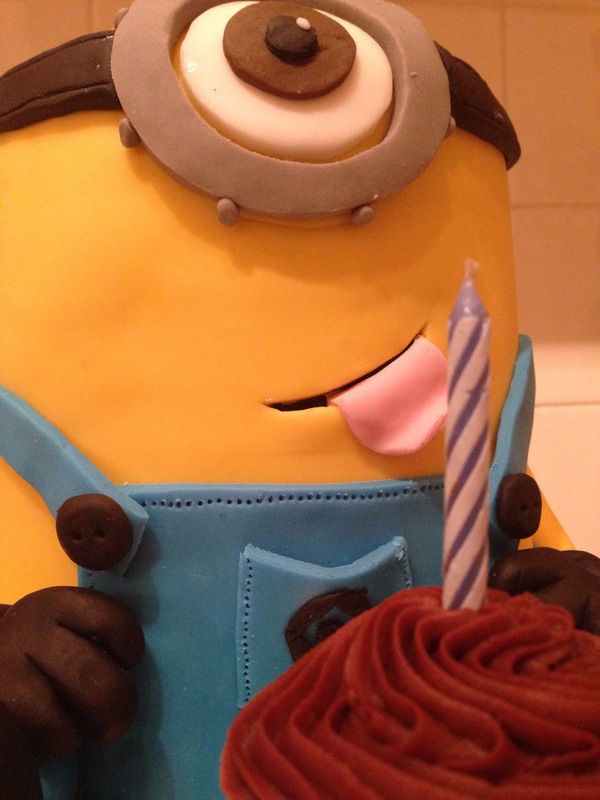 Therefore, this year, I wanted to make him a cake which would make up for the last few years. 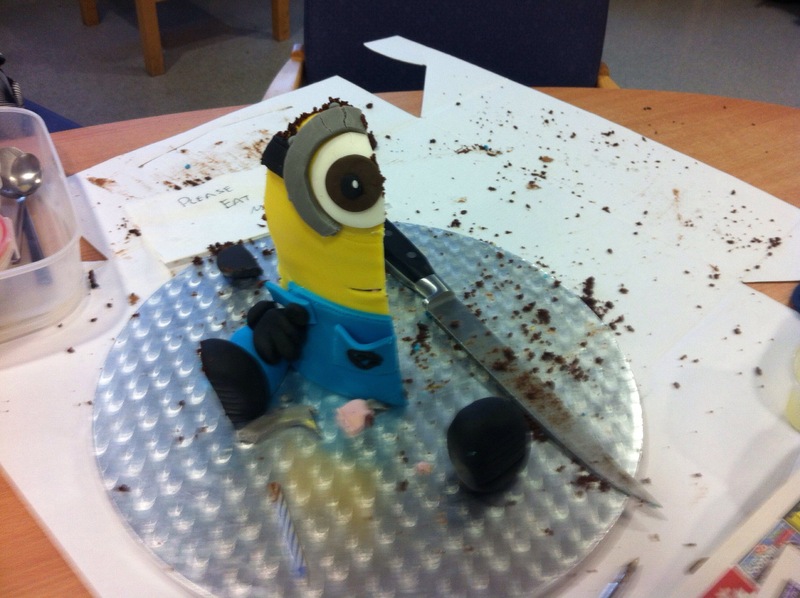 Not much thinking was required – he came back from a recent trip to Universal Studios with a minion water bottle, a minion mug and a set of minion pyjamas for me… so a minion cake it was! 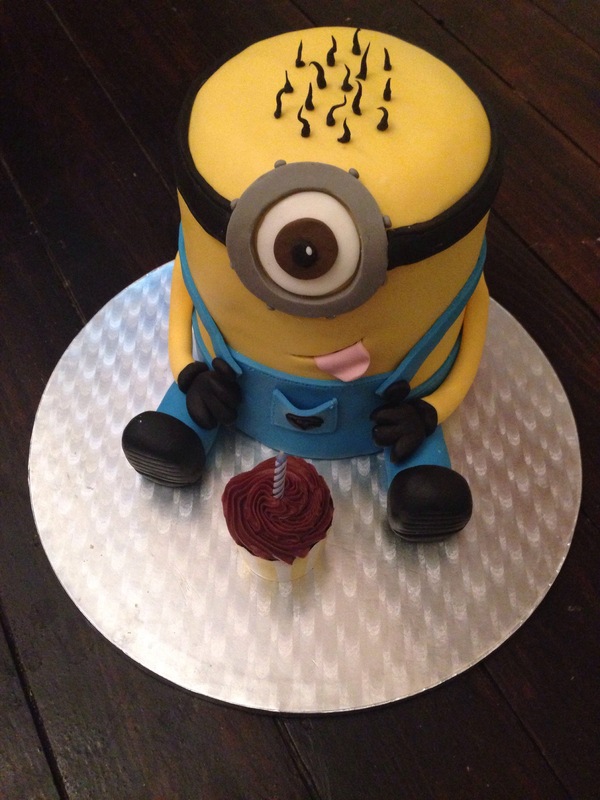 The minion started off as two 7″ deep round chocolate cakes, cut into layers (3 layers each), stacked on top of each and sandwiched together with buttercream. I shaped the top by cutting off the edges to round them and then did a thin layer of buttercream over the whole thing. 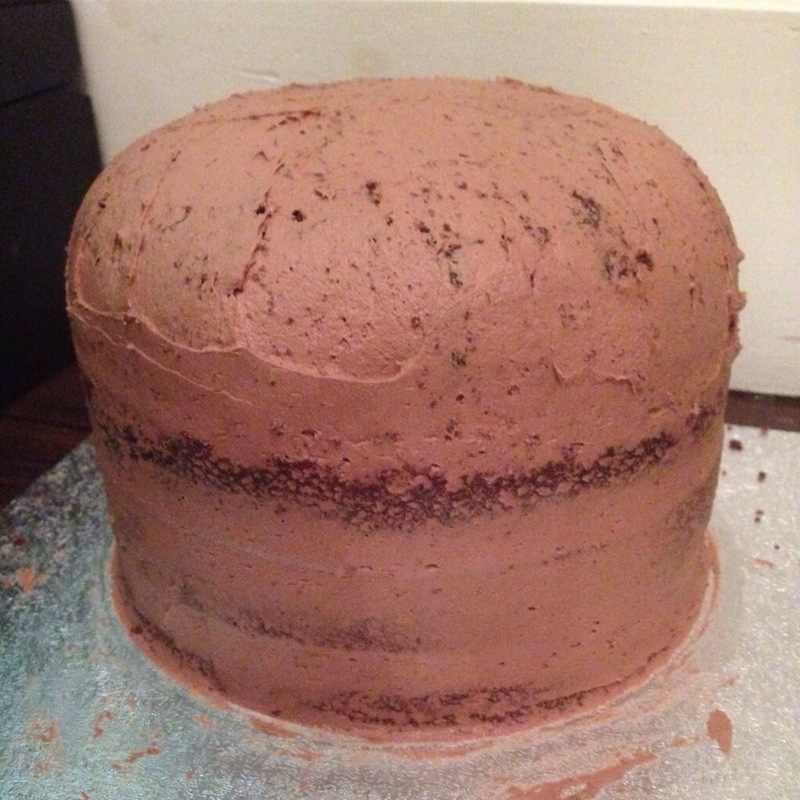 After looking at it, I realised this wouldn’t be tall enough so I then baked another 7″ chocolate cake to add to the bottom. 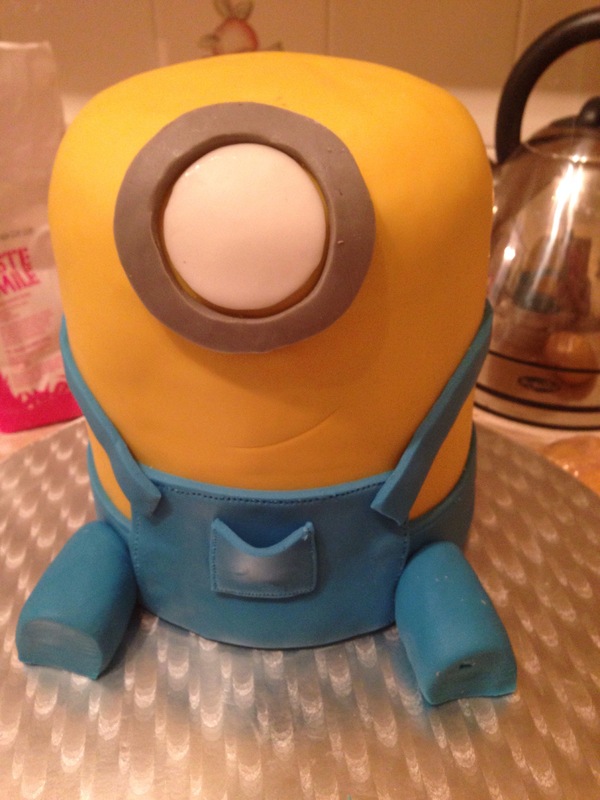 After they were all stacked on top of each other and the layer of buttercream on the outside had set I rolled out a large amount of yellow fondant icing and smoothed it over the top. When I’d smoothed out all the cracks I rolled out some blue fondant icing and cut out some rectangles to make the dungarees. I stuck these on with a light brushing of water. To add a bit more detail I used a cocktail stick to make a line of small holes round the edge of the front and back flaps of the dungarees to look like stitching. I then used a knife to indent a line about 1mm under the top of the blue strips round the edges. I then cut out two strips of blue icing and stuck them on as the dungaree straps to join up the corners of the front and back flaps. I cut out a small square of blue icing and stuck this on as a pocket – I only stuck down three edges so it looked like the pocket was open. As before, I used a cocktail stick to make stitching marks around three sides of the pocket. The remaining blue icing was shaped into a log and then cut in half to create the two legs. The next task was to make the eye. Using two round cookie cutters, one smaller than the other, I cut a ring out of grey icing. I then used the smaller cutter to cut out a circle of white icing. I stuck both of these onto the face. Using some of the left over grey icing I rolled out some small balls and stuck them round the edge of the grey ring. 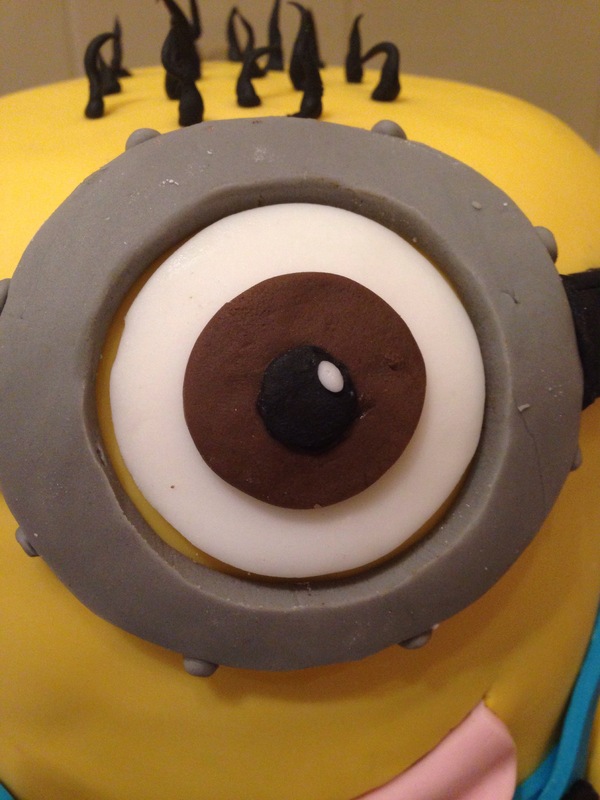 The eye was finished off with a small circle of brown icing stuck in the middle of the white circle, with a smaller black circle on top of that and finally a dot of white icing. Next I rolled out some black icing and cut out a long strip to go round the back of the head. As with the dungarees I used a knife to make an indent on the black strap about 1mm from each edge – it’s not necessary but it does add the finishing touch and make it look neater. 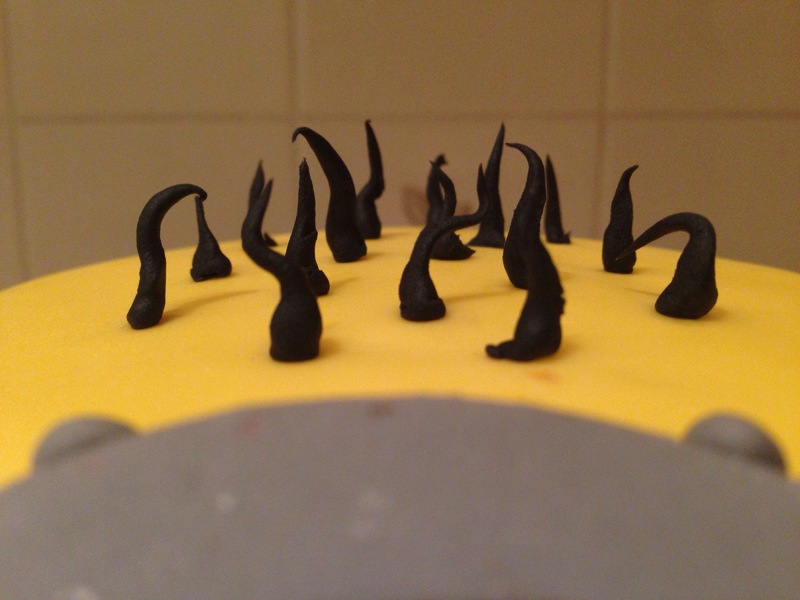 I rolled some bits of black icing between my fingers to create long cones and stuck these to the top of the head as hair. I used more black icing to create shoes, hands, a “G” for the pocket, and two black buttons to go on the dungarees. Leftover yellow icing was rolled into two long thin sausages to make the arms. 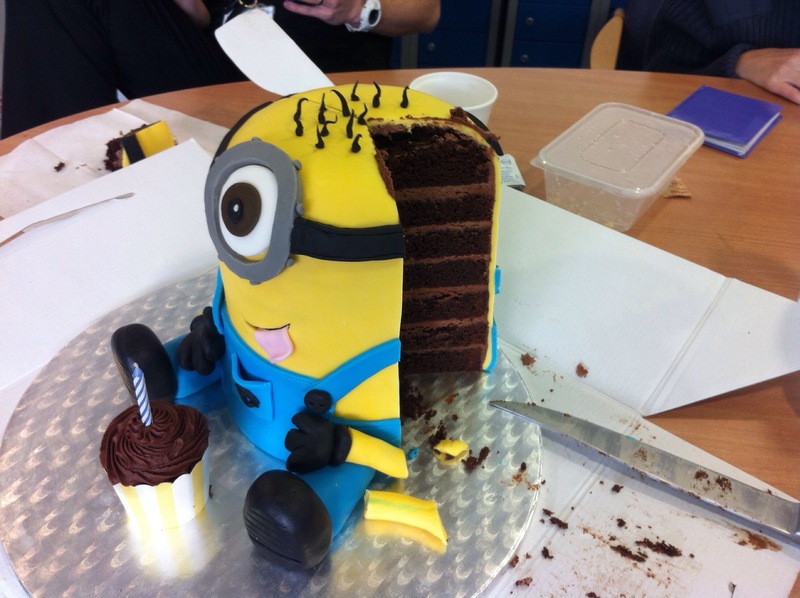 The final touch was to create the mouth – I used a knife to make a slit in the icing and then stuck on a tongue made out of pink icing. Since he was a birthday cake I used the off cuts of the cake and left over buttercream to make a cupcake and stuck a candle in.